In Episode 3 of the Incarnate Process, we examine one of the most exciting characters in the game/story. Today we see the first incarnations of King Eloden. These silhouettes really struck me. Having seen many final pieces by Dylan Pierpont, I just knew this would really shape up to be an awesome character as we continued to collaborate. Distinguishing features: Harromere looks like a mountain man; a very hairy dude, but he keeps his face clean shaven, usually has a 4 o’clock shadow by noon. The man looks like a beast, he’s huge. He’s not obese, just massive. Maybe he is a little heavy set, but by no means does this constitute laziness, he is always on the move and the guy eats like a… well, a king. He definitely has dreadlocks. We would hardly be able to see this though because of his head dress. His barrel chest and massive muscles are only rivaled by Dlone Kynazarr, whose arms might actually exceed Harromere’s in diameter. However, Harromere is bigger (as in brawn) than he is, he is a brute-force mountain-man wild-person. Think of Harromere as having gotten his brawn and muscle in the same way as would a lumberjack, whereas Dlone is more built like a bodybuilder pumping iron, as a blacksmith (just comparing to Dlone for reference, please refer to Dlone’s character profile for more info on him). I don’t mind if one of the concepts introduce something totally different than the the bear on his head, perhaps showing his really long, thick dreadlocks bound together in a ponytail like a collection of sticks. The third (concept) should show the bear maybe incorporated differently, maybe over the shoulder with the bear on one side and the antlers on the other. Another armor related item Harromere wears are MOOSE ANTLERS on his shoulders as pauldrons, this may be challenging but I think that this idea is a good one (you know, so that the swell of the antlers form to the shoulders… remember, this guy is 5 inches taller than [link removed]… huge). His weapon is a Doubleheaded Axe: the haft of this axe may stand as as tall as halfway up to his torso from the ground (if the axe were stood on its head). This axe has been handed down from king to king throughout the generations, so its been in his family a long time. There were discussions of even having him wear bark as part of his armor, but honestly this guy isn’t too worried about getting hurt. Harromere may have crude tools tending to forest or animal related tasks, perhaps smaller hatchets, claws for climbing trees, leather straps, fur skin stuff, I like the idea of a horn being tied to his belt or whatever, anything that you could think of that would be cool related to that kind of stuff; you have the creative authority to add whatever you think suits this character. Making choices between so many great elements wont be easy! Good deal guys! The moose antlers are going to be interesting for sure. I might layer a few together and tie them up with twine or leather so they conform to his round shoulder more. But it’s definitely an interesting design element.Yep. the side armor was meant to be bark as in the description. I’ll just have to put a layer of leather or something for that to rub up against so it’s not just just bark-on-skin. The dreads can still show with the bear head on once we get into the painting. They just don’t show up in the sillos right now. But I do like the ponytail dread idea, and that’s definitely something that we would have to have the bear draped on his shoulder for. 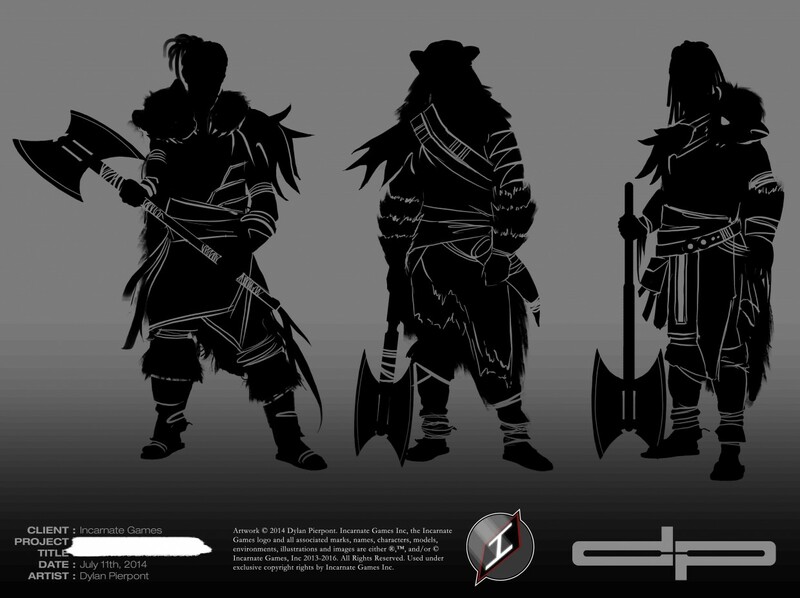 Stay tuned for EPISODE # 004: Kynazarr Concepts which will be posted soon!